Simply stated, a medication error occurs when a mistake is made in either prescribing, dispensing or taking medicine. The Institute of Medicine estimates that about 1.5 million people are injured by medication errors annually in hospitals, nursing homes or in outpatient settings. Meanwhile, a recent study published by the journal Clinical Toxicology estimates that the number of medication errors occurring at home doubled from 2000 to 2012. Many of these injuries are serious, hospitalizing 200,000 patients or more every year and accounting for 7,000 deaths. 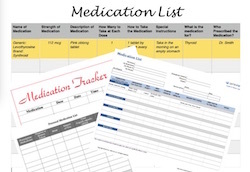 Maintain an updated medication list and share it with all your care providers. Download one here. Wrong Dose: The most prevalent medication error is incorrect dosage, which can occur when a mistake is made by either the patient or health care provider. Transposing the amount of a dosage by just one decimal point, for example, when writing or filling a prescription can have serious consequences. Adults who take multiple prescriptions can easily double a dosage when two pills look similar. Dosage errors are also common with small children, as their dosages are limited by weight. Wrong Medication: Like dosage errors, taking or prescribing the wrong drug can result in a medication mishap. One patient might receive a different patient’s medication at a hospital or nursing home because of sloppy record keeping, for example. Wrong Administration: Even if you are taking the right medicine in the right dose, it must be taken as directed. Many patients skip scheduled dosages or stop taking a medication altogether. Other medicines shouldn’t be taken on an empty stomach, with other over-the-counter drugs or while drinking alcohol. Where and When: Patients are at greatest risk to medicine mistakes during transition from one health care setting to another, whether from one part of a hospital to another, from hospital to nursing home, from hospital to home or even from one pharmacy to another pharmacy. Miscommunication during a hospital or nursing home shift change can also trigger a medication error. 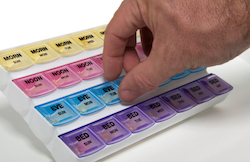 Use pill boxes to organize multiple medications by day of the week and time of the day. Make sure you know the name and dosage of the medication your doctor has prescribed. Understand when and how the medication should be taken, and what side effects might occur. In addition to talking to your doctor or pharmacist, check out your prescription on the FDA’s Drugs.com. When you pick up the prescription from a pharmacist, check that it’s the exact medication your doctor ordered (different drugs often have names that look or sound similar). And contact your doctor or pharmacist immediately if you are experiencing any unexpected changes in how you feel after starting a new medication. Your medication could be in a pill form, or maybe it needs to be injected. Eyedrops and eardrops can easily be confused. Always take your medication in the prescribed method. DO NOT chew pills if they are not meant to be chewed, cut pills if they are not meant to be cut or take any dosage other than the one specifically prescribed to you. It may sound simple, but an accurate, updated medication list can prevent a lot of drug errors. Sit down with every one of your prescriptions and record the name, reason taken, dose, time of day, form (liquid, capsule, tablet, etc.) and any special instructions. Add the same information for over-the-counter medications, and then update the list any time there is a change. Honesty is critical, so don’t leave anything out. Disclose any allergic or adverse reaction experienced in the past when taking a medication, no matter how long ago it occurred. Add these reactions to your medication list and consider a medical ID bracelet, smartphone alert or other type of notification in case of an emergency. Store prescriptions in their original labeled containers. The more medications you take, the higher the risk for confusion or error, so use a pillbox if you take more than one medication a day. Thirty-six percent of seniors use five or more prescriptions.